Congratulations to Esther for winning this giveaway! We have an awesome giveaway brought to you by Petit Collage today! We’ve shared our love for Petit Collage before here, but just highlighting one of their awesome products doesn’t do them justice! Their so-sweet minimal and modern collection is filled to the brim with pieces that have that retro feel that is so hard to find done well. From wooden wall decor, to beautifully crafted mobiles, puzzles, and dolls, you could easily decorate a room or two, and add to your collection of beautiful keepsake toys and games. Ready to try your luck? Visit Petit Collage and let us know what you’d buy with your $150 credit! Follow Petit Collage on Facebook and Twitter. Follow Small Fry on Facebook // Instagram @smallfryblog // Pinterest // Twitter // leaving additional comments for each. This giveaway is open until Thursday June 13th at 11:59 pm MST. A winner will be notified via email, good luck! I would definitely buy a large wooden panel! Love those! Oh, how to choose!!! I think I would get the modern jumble nesting blocks and a cute print for the nursery! I love the funny bunny and queen of hearts dolls and know my girl would adore them!! I follow sf on fb. I follow sf on Pinterest. I follow sf on Instagram. With a new baby on the way, I would buy the growth chart or a personalized name sign for the nursery! I would buy the wooden wall art, a mobile and the bunny. Everything they have is amazing! I would get personalized wood prints for both of my girls. and the tree growth chart- that is so cute! follow small fry on instagram. oh my i LOVE petit collage! i would buy the mr. monkey modern doll and so many of those gorgeous wooden prints! following petit collage on FB! growth chart and wooden toys! following petit collage on twitter! Following Small Fry on Twitter! Following Small Fry on Instagram! Following Small Fry on FB! I love the safari jumble and the modern jumble! Following Small Fry on Pinterest! That money would be blown in a second. On their posters, the stackable blocks, or any one of their puzzles, I’m dying! I follow SF on insta. Oh there is so much to choose from! I would definitely get the Animals A-Z Alphabet cards and the Funny Bunny for my Little One due in July. Love the woodland friends mobile and the name plates so adorable. I love that ” you are my sunshine” piece. It’s my youngest’s favorite song. I follow you on instagram. Thanks for the opportunity! I follow you on facebook. Thanks for offering the giveaway! I love the Funny Bunny doll! The whale mobile and the alphabet wall decals and the stuffed bunny! Following small fry on Facebook! Love the USA wood panel! Classic Bamboo Mobile, Mr. Monkey and Fruits + Veggies Nesting Blocks, wow so so many things in 150;)) hope ill get it!! I would buy some more of your wooden prints (we have some already and love them), as well as the bunny stuffy. Thanks for the giveaway! I follow Petit Collage on fb. I’d like the safari print! I would love the nesting blocks and Mr. monkey doll for my little. Great giveaway! Thanks! Also, following Small Fry on Instagram. It says the giveaway ends June 4th which was yesterday? I’m guessing it’s just a typo? Love the bike print on wood, safari jumble wooden animals, and funny bunny doll! I would have a super hard time choosing but for sure the fabric family tree decal. I follow Small Fry on FB. I follow Small Fry on Instagram. I follow Small Fry on Pinterest. I LOVE their prints on wood. I would probably pick out the “camera girl” print for my redhead! Thanks for the great giveaway! I just love your blog! Liked Petit Collage on Facebook! I follow Small Fry on Facebook. i love the modern jumble nesting blocks and the safari jumble! these would be great first toys for my first baby (to be born first week of september). fingers crossed! I’d buy a lot of the prints of wood and some puzzles. I love the wooden wall decor. I would get some for my girls’ rooms! Like Petit Collage on Facebook! Follow Petit Collage on Twitter! Like Small Fry on Facebook! I follow Small Fry on Instagram! I follow Small Fry on Pinterest! I follow Small Fry on Twitter! I love Petit Collage – with $150 I would get the “Blue bird on Wheat” jumbo wood panel and the “Fox Baby” framed print on wood. I would definitely start with the school of fish mobile. Perfect for my son’s room! Followed Small Fry on Twitter! The safari jumble! Love the wooden toys and games! I follow you on Instagram and FB. Your daughter is darling and always makes my days brighter. I would gift the wooden mobile to my sisters nursery and my children wooden toys! Love love love your product line! I love the wall art! It would be so hard to choose between all of the options! love this shop! i would get the pennant and confetti decals for our chalkboard wall and i would get the the ‘home is where the heart is’ wood print. I love the wooden puzzles and the wood panels. LOVE! What would I buy… Oh my goodness! I want two growth charts for my twins, and and then the alphabet wall art, Ooo and any of the whale prints on wood! I follow sf on Pinterest! I love all their wood prints! So cute! My daughter would love the safari jumble! I love the Modern Jumble Nesting Blocks and the Confetti Wall Decals. Very cute! i already have one of their mobiles, so i would get the ‘my favorite things’ art in blue and san francisco print for my son’s room. love this company so much! I have been wanting the Up in the Air bamboo mobile since I was pregnant for my baby’s nursery. I would also add the Transportation poster & Tree growth chart! I love the wooden frame, the boat and monkey prints! Oh and the transportation ABCs as well! I follow Petit Collage on Twitter! Such beautiful pieces. I have twin baby boys and would love to decorate their nursery with the wooden wall art, especially the “to the moon and back” panel. I’d buy my girls each a doll and I’d also have to get a wood print or two. Lovely stuff. I adore everything! I would love the jumbo panel in Yellow Bird Blossoms! So sweet. I follow Small Fry on FB! I follow Small Fry on IG! I follow Petit Collage on FB! I have been wanting a mobile from them for so long.. Maybe the safari friends one, or blue birds. And the cute safari jungle puzzle! Following Petit Collage on Facebook! Following Small Fry on Pinterest!!! I follow Small Fry on Instagram:)! I would love the nesting blocks and the tree growth chart! Everything is adorable. Hi! What a great shop! My favourite items are the prints on wood. If I won, I’d choose the pink, the blue butterfly and the sailor boy prints + the elephant love tape. I follow Petit Collage on facebook as Marta García. Thank you! I follow Small Fry on facebook as Marta García. Thank you! I follow SF on Facebook. Oh man, what wouldn’t I buy!! I love all of the personalized art! Such a great shop!! Love the stuff! I would definitely get my boy some wall decor – lion baby (he’s a leo) , you are my sunshine (his fav song). Growth chart?! YES PLEASE. Also, so in love with the dolls – their outfits ROCK! Ooh! I’d love a new growth chart for my littlest’s room! I follow smallfry on instagram (m33c). I would spend it on some new wall art for my daughter’s room- sorely needed. I follow Small Fry on Facebook! The Funny Bunny Doll is adorable! I love the Tower of Birds paper mobile as well. All so precious. Can’t wait to spoil my new baby girl. I follow petit collage on facebook. I love the Safari Jumble puzzle and the wood panel art. I would use my credit to go towards the purchase of the Jumbo World Map! I love the animal art cards! The Fox Baby print on wood. Love! I follow Petit Collage on twitter. I follow small fry on Twitter. i have been eyeing that wooden safari puzzle for my baby boy due in october! everything is so darn lovely though..
I’ve been inspired by Lorena and her wonderful design work over the years and am a huge fan of Petit Collage! I would definitely get the Tree Friends growth chart and Baby Lion print for my little Leo toddler’s room—along with many other things 🙂 Followed SF/PC. Thanks for the opportunity! My little one is only a few months old, so I would go with some toys for babies. The safari jumble puzzle and nesting blocks maybe! I love Petit Collage! I would buy some nesting blocks, alphabet cards, and modern dolls for my baby girl. Thank you for the opportunity! I also like petit collage on facebook. I also follow small fry on fb. I love the tower of birds mobile! 🙂 and the nesting blocks! Those blocks are on my wishlist so that’s the first thing I’d go for! I already like you on FB! I love the elephant parade mobile! SO cute! I would choose a Robot growth chart! Awesome giveaway! I kind of want those dolls for myself!! Puzzles! I love the fruit puzzle & the alphabet & animal art cards! Thanks! I would definitely get one of the prints on wood! So awesome. I love Petit Collage! I had a hard time narrowing it down, I think I would get some of the wood art prints, a mirror and a mobile! I would get the ny and robot wood panel pictures and a growth chart. I am so impressed with this site! I tank there are beautiful, unique tags and reasonably priced! I would get the Up In The Air mobile for my son’s nursery and the city wood panels for the play room! I think I would get a personalized wood panel and some puzzles. I really like the alphabet art, the train, robot and to the moon and back prints, and the world wood panel is beautiful! I would buy a “Funny Bunny” and a “Forest Friends” Mobile! We are preparing the nursery for baby #2, so any of the mobiles or art would be a great addition! I love the cat and bunny dolls, but have been eyeing the Home wood print. 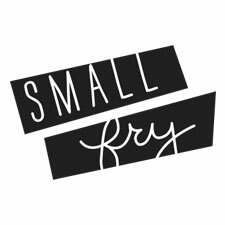 Annnnd follow SmallFryBlog on Twitter. Whew! I love all the dolls! I love their shop! I’d get a Curious Cat doll, animal alphabet art cards, and some wall art. I love the nesting blocks from Petit Collage! Thanks for the giveaway. I liked Small Fry on FB. I liked Petit Collage on FB. Following Small Fry on pinterest. Following Petit Collage on twitter. I love the Alphabet Cards and Safari Puzzle at Petit Collage. Such cute stuff! I love their puzzles. Following Petit Collage on FB. I would definitely get all the ABC’S cards and prints. Such a fun and exceptional way to teach the alphabet! I’d get an original collage! I follow Petit Collage on Facebook. I would use $150 gift card towards Jumbo Wood Panel London & San Francisco so we can dream everyday of places to go. Follow Petit Collage on Facebook and Twitter. I love everything under the “gifts” section-the dolls, tape, notecards… all so sweet. I also love all of the wood prints. Thanks so much! I’d buy some prints on wood. I’d get a variety of toys to keep on hand as gifts: Safari Jumble Puzzle, Memory Games, Dolls, Nesting Blocks etc.. I love the prints on wood! I like PC on FB. I like SF on FB. I love Petit Collage! I would probably purchase one of their gorgeous jumbo wood panels and an alphabet poster. Great giveaway! I am a fan of Petit Collage on Facebook. I am a fan of Small Fry on Facebook. Shut the front door! This is an awesome giveaway! If I won I would put it towards the US wood panel, my son would die. I follow smallfry on Facebook! I follow smallfry on IG! I follow smallfry on Pinterest! I follow petit collage on Facebook! love the owl family mobile and the safari jumble wood puzzle. great giveaway! I LOVE their wooden wall art!! SO many amazing pieces that I could use to decorate my boy and girl shared room. sometimes its HARD finding good unisex items!